What better way to get your kids to eat their lunch? Make it cute! And fun! A little easier than traditional bento and involving only your average sandwich ingredients. 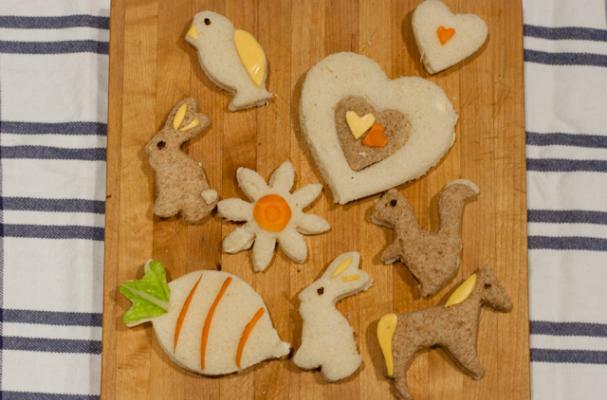 Using cookie or sandwich cutters (specially designed for the task! ), you can easily take your sandwich from blah to "I want one, too!" I've found that it's much easier to cut each piece individually - bread slices, cheese, meat (if you're using it), lettuce or veggies, etc. Quick, easy and perfect for a packed lunch! I used two different kind of bread (white and whole grain - both gluten free in this case), carrots, lettuce, raisins (eyes) and cheese slices for the sandwiches in the photo, but get creative - radishes, avocado, onion - just about anyhting you would use in a sandwich, you can use on a sandwich to decorate! I want the recipe for the bread. It looks like regular bread! Particularly the whole grain one. I can't give you a recipe because I used store-bought -- Canyon Bakehouse offers a really great whole grain bread (San Juan, I believe) that even tastes similar to whole wheat (or so I've been told). For the white bread, I just used Udi's.